What I offer you here, my pi and pie loving friends, are hand pies. No more mess, or (in my house) arguments over whether someone is dipping inside the un-cut portion of the pie to pull out more filling than they deserve. These are flakey, buttery, fruit-filled, wedge shaped, hand-held treats of deliciousness! In a medium sized saucepan, combine blackberries, sugar, cornstarch and lemon juice. Cook over low heat, stirring frequently, until well combined and blackberries are hot and releasing juices. Crush blackberries in the saucepan with a potato masher. Stirring constantly, bring to a boil by increasing heat to medium-high. Boil and stir for approximately 3 minutes, then remove from heat. Add vanilla extract, and continue to stir until saucepan has cooled enough that mixture will not burn. Pulse flour, sugar, and salt together in a food processor, or mix well in a large bowl. Add chopped, cold butter and continue to pulse until coarse crumbs form - or use pastry knife. Turn dough out onto clean, floured surface and dust with a little more flour. Kneed, adding a little flour if needed, or scant cold water, until smooth and no longer sticky. Divide the dough in half, roll into balls. Wrap in plastic wrap and refrigerate for at least 30 minutes. Turn cooled dough onto a clean, floured surface, and use a rolling pin to roll each ball into an 8” circle. Place one circle on top the other, then use a pizza cutter to cut into 8 double layer pie wedges. Working with a top and bottom pastry layer at a time, separate, brush the edges of each with egg/water mixture, place 1-2 heaping tablespoons of filling in the center of the bottom layer, then cover with the matching top layer of pastry. Crimp the edges with a fork to seal and place on parchment covered backing sheet. Repeat for all 8 wedges. Back at 400 degrees for approx 20 minutes, until edges begin to turn golden brown. In medium bowl, whisk together powdered sugar, cream, lemon juice, and lemon zest. 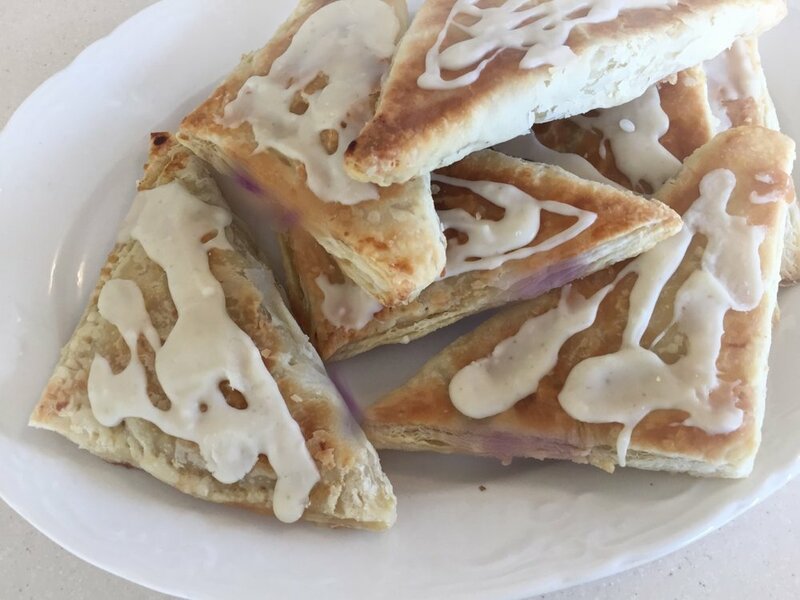 Drizzle over cooled hand pies. Let the glaze set (15-30 minutes) before serving.